Photosynthesis is the process whereby organisms take in light energy and convert it into useful chemical energy. It is a critically important process in most reef aquaria, but one which most aquarists pay little attention to, aside from the recognized importance of having appropriate lighting. This article is the first in a series that looks at photosynthesis in reef aquaria from a chemical perspective. Such chemical issues, for example, include how organisms get the raw materials for photosynthesis, whether aquarists need to "supplement" those, how organisms eliminate the "waste" products of photosynthesis, what are the chemical implications of too much or too little light, how calcification in corals and clams relates to photosynthetic efficiency, what the biochemical machinery is for collecting light and converting it into energy, and how organisms have evolved these processes in relation to their natural habitats. The answers to these questions can have an important bearing on husbandry practices in ways that reef aquarists might not have considered. In particular, topics covered in this article include whether the pH or alkalinity of an aquarium or a refugium might impact the rate of photosynthesis, and whether aquarists should consider the availability of carbon dioxide to photosynthesizing organisms. This article deals primarily with the first reactant in this equation, carbon dioxide. The processes leading to the uptake of carbon dioxide by photosynthesizing marine organisms are an active area of research, with most of the relevant publications in this area being released only in the past five years. It turns out that the symbiotic dinoflagellates (zooxanthellae) inside corals and clams1 are a special case in terms of carbon dioxide acquisition due to the surrounding host animal, as well as the significant amount of calcification taking place in the same organism. Because photosynthesis and calcification may be chemically interrelated, the special aspects of photosynthesis in symbiotic and calcifying organisms will be detailed in a future article. Freshwater aquarists caring for brightly-lit planted aquaria have long known the importance of CO2, and often add carbon dioxide directly to the aquarium water in one way or another to supply those tanks' substantial need for this material. Reef aquarists, on the other hand, might have just as much or more photosynthesis taking place, but rarely worry about adding carbon dioxide. Why? That's one of the topics to be detailed in subsequent sections of this article. The answer is not that seawater contains more CO2 than does freshwater, but rather that seawater contains other chemicals that can, in some cases, be used to supply carbon dioxide. Many organisms in a reef aquarium rely on photosynthesis to survive. These include diatoms, green hair algae, cyanobacteria, macroalgae, Tridacna clams and most corals and anemones that aquarists maintain. In the case of clams, corals and anemones, this photosynthesis is actually carried out by symbiotic organisms (zooxanthallae) that live within the tissue of the host animal. In every case, however, the cells that photosynthesize need to incorporate carbon dioxide somehow, and they excrete oxygen. Sometimes obtaining adequate carbon dioxide is easy for photosynthesizing organisms, and sometimes it is difficult, requiring them to develop special mechanisms to obtain it rapidly enough. In order to understand how this happens in a reef aquarium, it is first necessary to understand what happens to carbon dioxide when it dissolves into seawater. Carbon dioxide is an interesting molecule. When it dissolves into water it can take a number of different forms. Even the rate at which it can move between some of these forms impacts how organisms must develop special mechanisms to be able to take up enough during rapid photosynthesis. Carbon dioxide is present at about 350 ppm in normal air. It was lower in the past, and has been steadily rising for the past 100 years or so, largely due to the burning of fossil fuels. A liter of air weighs about 1.3 grams, so at 350 ppm carbon dioxide, that liter of air contains about 0.00046 grams (0.5 mg) of carbon dioxide. This very low amount, coupled with the kinetic issues (i.e., the slowness) of carbon dioxide's entry into seawater, explains why it is often difficult to keep reef aquarium water aerated enough to keep the pH from rising when processes such as photosynthesis or the addition of limewater consume carbon dioxide. The time for half of the CO2 molecules added to water to hydrate is on the order of 23 seconds. That rate is slow enough that many organisms have developed enzymes to speed it up. Carbonic anhydrase, for example, catalyzes the hydration and the reverse reaction (dehydration) to allow organisms to process carbon dioxide more rapidly. It is used by a wide array of organisms, from algae to people. In people, it is important in allowing carbon dioxide gas to be expelled from the lungs. Without it, the carbonic acid in the lung tissues would not convert rapidly enough to gaseous CO2 to permit it to be adequately expelled by breathing. The conversions between carbonic acid, bicarbonate and carbonate are much faster than the hydration of carbon dioxide and for most purposes can be considered instantaneous. Consequently, carbonic acid, bicarbonate and carbonate are in equilibrium with each other at any given point in time. The primary factor that determines the relative amount of each species at equilibrium in seawater is the pH, with a small temperature effect as well. In order to assess whether an organism requiring CO2 could benefit from any of the forms besides CO2 itself, it is useful to understand how much of each is present in seawater. Seawater contains about 670 times more unhydrated carbon dioxide than the hydrated version (carbonic acid). At most pH values attained in a reef aquarium, however, bicarbonate is far more prevalent than carbon dioxide. These pKa values imply that seawater at pH 5.85 contains equal concentrations of carbon dioxide and bicarbonate, and that seawater at pH 8.92 contains equal concentrations of bicarbonate and carbonate. Figure 1 shows data calculated for all three species as a function of pH in seawater. From this graph, it is clear that if getting carbon dioxide itself is limiting at pH 8.2, it might be more efficient to get it from bicarbonate because so much more is present. In fact, roughly 200 times more bicarbonate than carbon dioxide is present in seawater at pH 8.2. In most reef aquaria the bicarbonate is present at between 2 and 4 mM (millimolar = meq/L), or about 122 to 244 mg/L bicarbonate. For comparison, carbon dioxide is much lower, on the order of 0.01 mM (0.5) mg/L at pH 8.2. Interestingly, that value of 0.5 mg/L for carbon dioxide in seawater is almost exactly the same as the concentration of carbon dioxide in air. Figure 1. Relative fraction of carbon dioxide and carbonic acid (black), bicarbonate (white) and carbonate (red) in seawater as a function of pH. Carbon dioxide is able to cross cell membranes because it is a small uncharged molecule with reasonable solubility in organic materials. Consequently, organisms that take up carbon dioxide can do so passively (without spending any energy) and with no special mechanisms (such as proteins designed to speed up that process). Many marine algae and other organisms take up some measurable portion of the carbon dioxide that they incorporate during photosynthesis by this process. As mentioned above, few marine organisms have been shown to rely solely on passive carbon dioxide uptake, but the carbon dioxide concentrating mechanisms are often unknown. As stated in a review article5 in 2005, marine diatoms fix more than 10 billion tons of carbon by photosynthesis each year, but "there are still a number of fundamental unresolved aspects of inorganic carbon assimilation by marine diatoms. It is not clear how the carbon-concentrating mechanism functions." Carbon dioxide can be actively transported across cell membranes by protein transporters. This process does not solve the problem of low levels of available carbon dioxide in the surrounding seawater, but it can ensure that uptake itself is not a limiting factor, and may be especially useful in environments where carbon dioxide is plentiful (implying low pH environments in seawater). The marine diatom Skeletonema costatum9 has been shown to have little capability of using bicarbonate to obtain carbon dioxide. It does, however, show active uptake mechanisms for carbon dioxide, and this capability depends on light levels. In higher light levels, the diatom shows higher affinity for carbon dioxide. This capability can be attained within two hours of exposure to high light, and slowly fades over a period of about 10 hours when returned to low light levels (where less carbon dioxide uptake is required). Presumably, the organism is producing a carbon dioxide transport protein when light levels are high and carbon dioxide is needed in large amounts, and it halts that production (allowing the transporters to slowly decline in population) when they are not needed. High ambient levels of carbon dioxide also repress the expression of its high affinity for carbon dioxide uptake. Apparently, this diatom spends the energy to take up carbon dioxide actively only when it is actually necessary to do so, and relies on diffusion when it can. If an organism is to obtain carbon dioxide from bicarbonate, several potential processes are available, and different organisms take different approaches. In many cases, the exact mechanisms have not been established. It is much easier to show that bicarbonate is a source of carbon dioxide for marine organisms than to show exactly how they take it up. A bicarbonate ion, being charged and insoluble in organic phases, cannot readily diffuse across cell membranes, so other mechanisms are needed. Such uncertainty of mechanism is the case for Ulva lactuca, for example. It has been shown to be able to photosynthesize when out of the water (say, exposed at low tide), taking up carbon dioxide directly, and also when in the water, taking up bicarbonate.10 But the exact mechanism of using bicarbonate to obtain carbon dioxide isn't known in this species. One common way to use bicarbonate is for the cells exposed to the seawater to use extracellular carbonic anhydrase on their surfaces. As mentioned above, the enzyme carbonic anhydrase catalyzes the hydration and dehydration of carbon dioxide and carbonic acid, respectively. These organisms present this enzyme to the bicarbonate-rich seawater surrounding them. Because the bicarbonate is naturally in rapid equilibrium with carbonic acid, and the carbonic anhydrase keeps the carbonic acid in rapid equilibrium with unhydrated carbon dioxide, the bicarbonate is used as a ready pool to supply carbon dioxide to passively cross cell membranes and be taken up (shown schematically below). The agarophyte Gracilaria lemaneiformis11 has been shown to take up carbon in this fashion. It has carbonic anhydrase both inside the organism and out. Inhibiting either of these types of carbonic anhydrase greatly decreases photosynthesis, but adding an anion transport inhibitor does not. Adding TRIS buffer to the extracellular fluid (seawater) also has no effect (the purpose of which is discussed in the following section relating to proton pumping as a possible mechanism). Photosynthesis in this organism is greatly reduced as the pH is raised (73% reduction when going from pH 8.0 to 9.0), presumably because the bicarbonate's propensity to form carbonic acid is reduced at higher pH. The brown alga, Hizikia fusiforme (Sargassaceae),12 from the South China Sea, has also been shown to exhibit carbonic anhydrase activity, both inside and out, and has been shown to be incapable of actively and directly transporting bicarbonate. 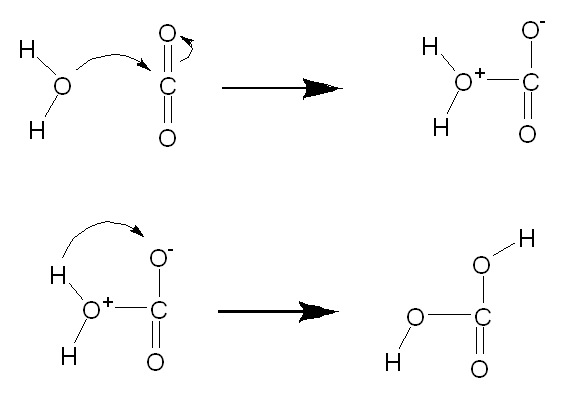 Consequently, its carbon dioxide concentration likely operates by the mechanism shown above. Two species of marine prymnesiophytes (Dicrateria inornata and Ochrosphaera neapolitana)13 have been shown, through the use of various carbonic anhydrase inhibitors, to use extracellular carbonic anhydrase to collect carbon dioxide from ambient bicarbonate. They also employ an energy dependent process for taking up carbon dioxide itself. Growth in high carbon dioxide environments represses the expression of carbonic anhydrase active in these species, but does not reduce the active uptake of carbon dioxide. An alternative way to obtain carbon dioxide via seawater bicarbonate is to take up the bicarbonate through protein transport mechanisms across the cell membranes, and then once inside the cells where it is needed, carbonic anhydrase converts it into carbon dioxide and hydroxide ion. The hydroxide is then pumped out, or H+ is pumped in, to achieve pH balance. Transporting ions across cell membranes using protein transporters is a widespread mechanism whereby organisms can get needed ions across a membrane through which they do not normally diffuse. Some of these are active transporters, using chemical energy to "pull" ions out of the extracellular fluid (our push them out, as necessary), and other transporters simply allow specific ions to pass though from high concentration on one side to lower concentration on the other side. The marine red alga Gracilaria conferta has been shown to have an active bicarbonate uptake mechanism.14 Three marine bloom-forming (red tide) dinoflagellates, Prorocentrum minimum, Heterocapsa triquetra and Ceratium lineatum,15 have been shown to take up bicarbonate directly. They show little carbonic anhydrase activity, yet bicarbonate accounts for approximately 80% of the carbon dioxide they use in photosynthesis. It is believed that these dinoflagellates are not carbon limited in photosynthesis due to their efficient direct bicarbonate uptake mechanisms. The marine diatom Phaeodactylum tricornutum16 was found not only to have an active bicarbonate uptake mechanism, but the researchers further identified at least two different mechanisms. In particular, they showed that part of the uptake depended on the presence of extracellular potassium, and this part of the total carbon dioxide uptake was eliminated when potassium was missing from the medium. A second direct bicarbonate uptake mechanism was independent of potassium, indicating the presence of at least two different pathways for transporting bicarbonate into this organism. 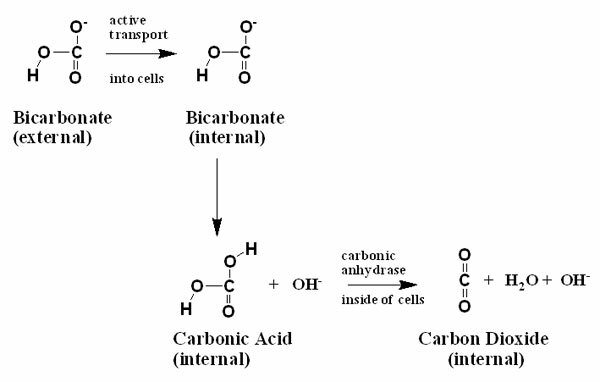 Another way to obtain carbon dioxide via seawater bicarbonate is to pump H+ out of the cells into the extracellular fluid (seawater near the cells) or into a special cavity where bicarbonate is present.17 This low pH causes the bicarbonate to become protonated to become carbonic acid. 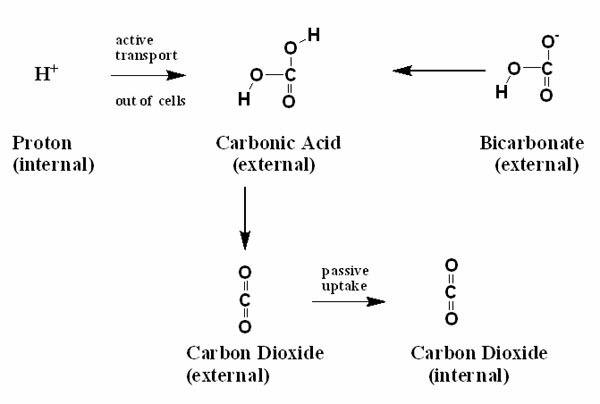 The carbonic acid can then transform into carbon dioxide, and pass across the cell membranes. The seagrass Zostera noltii Hornem18 has been shown, for example, to use proton pumping to gather bicarbonate in the form of carbonic acid from the water. It contains no extracellular carbonic anhydrase, but rather uses ATP (adenosine triphosphate, the fundamental currency of chemical energy in most organisms) to drive the export of H+. Evidence for this mechanism is found by adding a buffer to the seawater (TRIS) without changing the pH. This buffer keeps the pH near the cell surface constant, counteracting the beneficial effect of the proton pumping in lowering pH and converting bicarbonate into carbonic acid. The simple presence of a non-absorbed buffer in the water can decrease the rate of photosynthesis in this organism by almost 80%. One of the side effects of the necessity of taking up carbon dioxide to photosynthesize is that pH may affect the rate of photosynthesis, because the amount of carbon dioxide (as CO2 or H2CO3) in the water varies with pH. Assuming constant carbonate alkalinity, the effect is quite strong. A drop of 0.3 pH units implies a doubling of the carbon dioxide concentration. 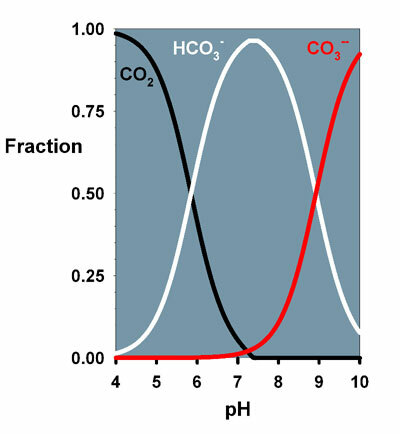 A reef aquarium at pH 8.5, for example, has one fourth the carbon dioxide of a reef aquarium at pH 7.9, assuming the carbonate alkalinity is the same. Aquarists may rightly wonder whether organisms are able to photosynthesize efficiently as the pH is raised. The answer is mixed. Some can and some cannot. Those organisms that rely solely on carbon dioxide may not. Those that rely on both carbon dioxide and bicarbonate have a better chance of retaining efficiency at higher pH because a much larger amount of bicarbonate is present, and it does not change as rapidly with pH over the range of interest to aquarists. Table 1 shows the response of a variety of macroalgae in terms of their ability to photosynthesize at pH 8.1 and 8.7. In seawater with constant carbonate alkalinity, there is 20% as much carbon dioxide at pH 8.7 as at pH 8.1, so an organism relying on carbon dioxide alone might experience a large drop in photosynthetic rate over this range. Clearly, the response varies with species. Chaetomorpha aerea, in particular, may be of substantial interest to aquarists. It is not necessarily the exact species that many grow in refugia (which is unidentified as far as I can tell), but this species of Chaetomorpha shows a 25% drop in photosynthesis when exposed to the higher pH. That drop is not as large as some other species, but may still be important, and it is more than many other species of macroalgae. Of course, the photosynthesis rate does not necessarily translate to growth rates. If other nutrients are limiting growth (nitrogen, phosphorus, iron, etc. ), then it may not matter if the rate of photosynthesis is reduced at higher pH. But because these nutrients are often present in surplus in reef aquaria, it may well be that carbon uptake is limiting in some cases, and in those cases aquarists might benefit from ensuring that the pH is not too high. Table 1. Relative rates of photosynthesis19 in seawater (measured by oxygen evolution) at pH 8.7 relative to pH 8.0. A value of 100 means that the rates were the same, and values below 100 indicate less photosynthesis at pH 8.7. Perhaps such relationships relate to the likelihood of spending considerable time in small closed tidal pools, where carbon dioxide would be more limited than in the open water, while at the very top of the shore, where exposure to air is most likely, the algae are again able to gain adequate carbon dioxide. The actual mechanisms used by some species (the brown alga Hizikia fusiforme,23 for example) that have multiple mechanisms actually change when exposed to air (taking up CO2 directly) and when immersed in seawater (using bicarbonate). Interestingly, three marine microalgae, Skeletonema costatum, Phaeocystis globosa and Emiliania huxleyi,24 were studied for their rates of photosynthesis and carbon uptake mechanisms in continuous light vs. those same species in light/dark cycles (12 h on/12 h off and 16 h on/8 h off). The rates of photosynthesis were nearly twice as high with light/dark cycles as with continuous lighting. In two of the species (S. costatum and E. huxleyi), but not the third, the contribution of bicarbonate to the total carbon uptake increased dramatically in light/dark cycles compared to continuous light. How this result might relate to growth and nutrient uptake in lit refugia where macroalgae are often grown to export nutrients is not known. However, it is a sign that perhaps continuous light is not optimal, in addition to being more expensive. 1. 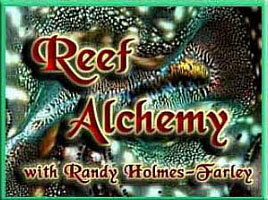 Limit the maximum pH attained in reef aquaria. I'd suggest limiting the pH to no more than 8.5, and lower is better from a photosynthesis perspective (although pH below 8.2 has its own disadvantages related to rates of calcification by corals and coralline algae). 2. Put a lit refugium containing macroalgae on a reverse light cycle to the main tank. Not only will this limit the maximum pH attained in both the refugium and the main aquarium, but it keeps the pH lower in the refugium precisely when the organisms in it most need the pH to be lower (during the refugium light cycle when CO2 is required). 3. Do not drip limewater (kalkwasser) into or upstream of a lit macroalgae refugium, because it limits availability of CO2. 4. Add the effluent of a CaCO3/CO2 reactor into or upstream of a lit macroalgae refugium, as it increases the availability of CO2. 5. The data on continuous light vs. day/night cycling are intriguing and suggest that a dark cycle may benefit lit macroalgae refugia, especially when the cost of the electricity to drive the lights is considered. 6. Keep the carbonate alkalinity up to at least 2.5 meq/l (7 dKH; 125 ppm calcium carbonate equivalents) to provide adequate bicarbonate for photosynthesis. Higher alkalinity may even be better, especially if the pH is also high, limiting carbon dioxide itself as a CO2 source for photosynthesizing organisms. This suggestion is likely already followed by most reef aquarists, but perhaps not by some with fish-only or related types of aquaria that also rely on macroalgae for nutrient export. The availability of carbon dioxide can be an important factor determining the rates of photosynthesis in marine organisms. Even though bicarbonate is used by many marine organisms, the ability of some species to photosynthesize may be limited by the pH and the availability of carbon dioxide. To be honest, before putting together this article, I had not worried much about such issues. My system deviates from several of the suggestions in the previous section (the pH often hits 8.5 or a tad higher, the lighting is continuous in three of my four refugia, etc.). I wonder what else I might learn about how to care for my system as I explore additional chemical aspects of photosynthesis in future articles? 1. Dinoflagellate symbioses: strategies and adaptations for the acquisition and fixation of inorganic carbon. Leggat, William; Marendy, Elessa M.; Baillie, Brett; Whitney, Spencer M.; Ludwig, Martha; Badger, Murray R.; Yellowlees, David. Biochemistry and Molecular Biology, James Cook University, Townsville, Australia. Functional Plant Biology (2002), 29(2/3), 309-322. Publisher: CSIRO Publishing. 2. Carbon acquisition mechanisms of algae: carbon dioxide diffusion and carbon dioxide concentrating mechanisms. Raven, John A.; Beardall, John. Division of Environmental and Applied Biology, School of Life Sciences, University of Dundee, Dundee, UK. Advances in Photosynthesis and Respiration (2003), 14(Photosynthesis in Algae), 225-244. Publisher: Kluwer Academic Publishers. 3. Algae lacking carbon-concentrating mechanisms. Raven, John A.; Ball, Lucy A.; Beardall, John; Giordano, Mario; Maberly, Stephen C. Scottish Crop Research Institute, University of Dundee at SCRI, Invergowie, Dundee, UK. Canadian Journal of Botany (2005), 83(7), 879-890. Publisher: National Research Council of Canada. 4. Inorganic carbon acquisition by the chrysophyte alga Mallomonas papillosa. Bhatti, Shabana; Colman, Brian. Department of Biology, York University, Toronto, ON, Can. Canadian Journal of Botany (2005), 83(7), 891-897. Publisher: National Research Council of Canada. 5. How do marine diatoms fix 10 billion tonnes of inorganic carbon per year? Granum, Espen; Raven, John A.; Leegood, Richard C. Robert Hill Institute and Department of Animal and Plant Sciences, University of Sheffield, Sheffield, UK. Canadian Journal of Botany (2005), 83(7), 898-908. Publisher: National Research Council of Canada. 6. The diversity of inorganic carbon acquisition mechanisms in eukaryotic microalgae. Colman, Brian; Huertas, I. Emma; Bhatti, Shabana; Dason, Jeffrey S. Department of Biology, York University, Toronto, ON, Can. Functional Plant Biology (2002), 29(2/3), 261-270. Publisher: CSIRO Publishing. 7. Source of inorganic carbon for photosynthesis in two marine dinoflagellates. Dason, Jeffrey S.; Huertas, I. Emma; Colman, Brian. Department of Biology, York University, Toronto, ON, Can. Journal of Phycology (2004), 40(2), 285-292. Publisher: Blackwell Publishing, Inc.
8. Acquisition of inorganic carbon by the marine haptophyte Isochrysis galbana (Prymnesiophyceae). Bhatti, Shabana; Huertas, I. Emma; Colman, Brian. Department of Biology, York University, Toronto, Can. Journal of Phycology (2002), 38(5), 914-921. Publisher: Blackwell Publishing, Inc.
9. Photosynthetic utilisation of inorganic carbon and its regulation in the marine diatom Skeletonema costatum. Chen, Xiongwen; Gao, Kunshan. Department of Biology, Hubei Normal University, Huangshi, Peop. Rep. China. Functional Plant Biology (2004), 31(10), 1027-1033. Publisher: CSIRO Publishing. 10. Photosynthetic responses to inorganic carbon in Ulva lactuca under aquatic and aerial states. Zou, Dinghui; Gao, Kunshan. Marine Biology Institute, Science Center, Shantou University, Shantou, Peop. Rep. China. Acta Botanica Sinica (2002), 44(11), 1291-1296. Publisher: Science Press. 11. Photosynthetic use of exogenous inorganic carbon in the agarophyte Gracilaria lemaneiformis (Rhodophyta). Zou, Dinghui; Xia, Jianrong; Yang, Yufeng. Marine Biology Institute, Science Center, Shantou University, Shantou, Peop. Rep. China. Aquaculture (2004), 237(1-4), 421-431. Publisher: Elsevier. 12. Photosynthetic utilization of inorganic carbon in the economic brown alga, Hizikia fusiforme (Sargassaceae) from the South China Sea. Zou, Dinghui; Gao, Kunshan; Xia, Jianrong. Marine Biology Institute, Science Center, Shantou University, Guangdong, Peop. Rep. China. Journal of Phycology (2003), 39(6), 1095-1100. Publisher: Blackwell Publishing. 13. Inorganic carbon acquisition in two species of marine prymnesiophytes. Huertas, I. Emma; Bhatti, Shabana; Colman, Brian. Instituto de Ciencias Marinas de Andalucia (CSIC), Puerto Real, Spain. European Journal of Phycology (2003), 38(2), 181-189. Publisher: Taylor & Francis Ltd.
14. Photosynthetic carbon acquisition in the red alga Gracilaria conferta. II. Rubisco carboxylase kinetics, carbonic anhydrase and bicarbonate uptake. Israel, A.; Beer, S. Dep. Bot., Tel Aviv Univ., Tel Aviv-Jaffa, Israel. Marine Biology (Berlin, Germany) (1992), 112(4), 697-700. 15. Inorganic carbon acquisition in red tide dinoflagellates. Rost, Bjoern; Richter, Klaus-Uwe; Riebesell, Ulf; Hansen, Per Juel. Alfred Wegener Institute for Polar and Marine Research, Bremerhaven, Germany. Plant, Cell and Environment (2006), 29(5), 810-822. 16. Evidence for K+-dependent HCO3- utilization in the marine diatom Phaeodactylum tricornutum. Chen, Xiongwen; Qiu, C. E.; Shao, J. Z. Department of Biology and Hubei Key Laboratory of Bioanalytical Technique, Hubei Normal University, Hubei, Peop. Rep. China. Plant Physiology (2006), 141(2), 731-736. 17. Carbon acquisition mechanisms of algae: carbon dioxide diffusion and carbon dioxide concentrating mechanisms. Raven, John A.; Beardall, John. Division of Environmental and Applied Biology, School of Life Sciences, University of Dundee, Dundee, UK. Advances in Photosynthesis and Respiration (2003), 14(Photosynthesis in Algae), 225-244. Publisher: Kluwer Academic Publishers. 18. Use of light and inorganic carbon acquisition by two morphotypes of Zostera noltii Hornem. Mercado, Jesus M.; Niell, F. X.; Silva, Joao; Santos, Rui. Centro Oceanográfico de Malaga, Instituto Espanol de Oceanografia, Malaga, Spain. Journal of Experimental Marine Biology and Ecology (2003), 297(1), 71-84. Publisher: Elsevier Science B.V.
19. External carbonic anhydrase and affinity for inorganic carbon in intertidal macroalgae. Mercado, Jesus M.; Gordillo, F. Javier L.; Figueroa, Felix L.; Niell, F. Xavier. Dep. Ecol., Univ. Malaga, Malaga, Spain. Journal of Experimental Marine Biology and Ecology (1998), 221(2), 209-220. Publisher: Elsevier Science B.V.
20. Habitat matters for inorganic carbon acquisition in 38 species of red macroalgae (Rhodophyta) from Puget Sound, Washington, USA. Murru, Maurizio; Sandren, Craig D. Department of Biological Sciences, University of Wisconsin-Milwaukee, Milwaukee, WI, USA. Journal of Phycology (2004), 40(5), 837-845. Publisher: Blackwell Publishing, Inc.
21. External carbonic anhydrase and affinity for inorganic carbon in intertidal macroalgae. Mercado, Jesus M.; Gordillo, F. Javier L.; Figueroa, Felix L.; Niell, F. Xavier. Dep. Ecol., Univ. Malaga, Malaga, Spain. Journal of Experimental Marine Biology and Ecology (1998), 221(2), 209-220. Publisher: Elsevier Science B.V.
22. CO2 concentrating mechanisms in algae: Mechanisms, environmental modulation, and evolution. Giordano, Mario; Beardall, John; Raven, John A. Department of Marine Science, Universita Politecnica delle Marche, Ancona, Italy. Annual Review of Plant Biology (2005), 56 99-131. Publisher: Annual Reviews Inc.
23. Comparative mechanisms of photosynthetic carbon acquisition in Hizikia fusiforme under submersed and emersed conditions. Zou, Dinghui; Gao, Kunshan. Science Center, Marine Biology Institute, Shantou University, Shantou, Peop. Rep. China. Acta Botanica Sinica (2004), 46(10), 1178-1185. Publisher: Science Press. 24. Carbon acquisition of marine phytoplankton: effect of photoperiod length. Rost, Bjoern; Riebesell, Ulf; Sueltemeyer, Dieter. Alfred Wegener Institute for Polar and Marine Research, Bremerhaven, Germany. Limnology and Oceanography (2006), 51(1), 12-20. Publisher: American Society of Limnology and Oceanography.